I'm scared. Please help me get home. Good morning readers. You're going on a roller coaster ride with me today. You will need a box of Kleenex. I feel this story is important because those of us who micro-chip our pets are being led down a false road of security. I'll begin by discussing the benefits of micro-chipping. Then I'm going to scare you and make you mad. With hurricane season upon us again, and the many other natural disasters we all face, micro-chipping your pet is the best return protection to count on. This is also a good idea regardless of where you live because many pets accidentally make a break for freedom is the back door is left open or someone forgets to close the fence gate. There are several things to consider when micro-chipping a pet. 1.Cost. This can range from $25 to $60 depending on whether you use a private vet or a clinic. Many vets offer a price reduction if done at the same time as sterilization. Make sure the cost quoted includes everything. You may be expected to pay a registration fee ranging from $18 for one pet to $50 to register several pets. 2. Compatibility of scanner. It's always a good idea to do your homework and even call around to different shelters in your area to find out if the chip being implanted can be read by a scanner in another area. Click for more on the compatibility of scanners. 3. Pain caused. This is a very simple procedure. A syringe is used to place the microchip under the skin at the neck and front shoulder. 4. Information database. Not all databases are the same. Make sure the database connected to the chip is reliable as this is where information on the pet owner will be stored in case animal is found and scanned. Here's a video that made the news a few months ago about a micro-chipped pet being found and returned home. The microchip is about the same size as a grain of rice and can be placed into the pet as young as 6-8 weeks. There are no parts to wear out as there are no mechanical parts in the microchip. It is the responsibility of the pet owner to ensure up to date information is kept on file at the database. Keep in mind most shelters and vets now have a reader to scan the pet, so your pet has a very high chance of being reunited with you if lost. More information on the companies that manufacture the microchips can be found at here. PLEASE check into having your pets micro-chipped. Some pet insurance plans cover some or all of the cost. It's better to spend a few dollars now than spend hours worrying once your pet is lost. Animals can't tell where they live. Collars can be lost. Micro-chipping is the best method of identification. Do you feel safe? I began this article some time ago to educate those considering micro-chipping. I never submitted it to pictures-of-cats because it didn't feel "complete." Now it is. We're going to visit the "dark" side of a missing pet. When your pet goes missing, don't sit back and wait for the phone call telling you to come get your furfriend. Not all shelters are good. I'd like to tell you about a cat and a dog that "fell thru the cracks" in the system. 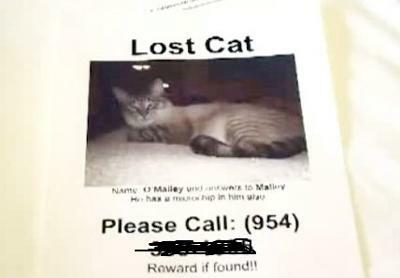 The following took place in Broward County, Florida in February 2010 when a male cat named O'Malley was turned into the Broward County Animal Shelter. First let me note the shelter had been overhauled in 2008 after being cited for violations too nauseating to go into in this story. O'Malley was found and turned into the shelter and euthanized on the fourth day. The staff stated he had an upper respiratory infection and was too sick to live. The Coombs family, O'Malleys owner's, weren't notified until after he was murdered at the shelter. This occurred because the chip wasn't read on the first scan, but showed up on the second scan performed after his execution. When questioned by the Coombs family about the mix up, the shelter got defensive and made remarks about O"Malley being malnourished and sick. 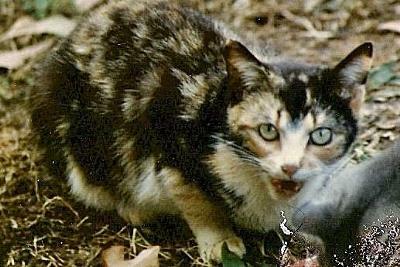 The cat was naturally thin and was being treated for a respiratory problem. It goes without saying this family is devastated and they want answers. The shelter people aren't talking due to an internal investigation. One thing I've learned through my research on micro-chipping is the chip can move around a bit. A collar and tag are still important to help reunite pet and owner. It wouldn't hurt to have your vet scan the chip at every checkup to be sure it's readable. Now for a happy story which almost had a horrible ending. I learned of this story last night on Facebook. I now belong to quite a few "causes" thanks to my writing here at pictures-of-cats.org. I was contacted about a dog named Magic, who is from Nottingham, U.K. Magic was micro-chipped and got herself lost a few weeks ago. I was going to write the story of Magic my way. I've decided instead to let her owner, Hayley Louise Burnham, tell it. 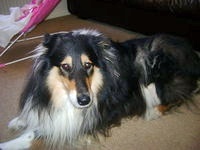 "Magic went missing on the 20th of July. I phoned the dog warden and RSPCA and put her on Doglost and National Pet Reg and also put posters up everywhere I could. I heard nothing on her until today when I had a phone call from a lady saying she thinks Magic is at Second Chance Kennels and Doglost phoned to say the same thing. I phoned them and they said it was too late: she had been adopted. I asked how this could happen when she is listed has missing on Petlog and everywhere else. They said the dog warden said they couldn't find a chip when she got to the kennel. They scanned her and found it under her belly. They said it's not their job to see if she's missing just to re-home her they have been in contact with new owners and told them and they have said they will talk about it and let me know in the morning if they will give her back." Thank goodness the new owners had the heart to give her back. She'd been with her furever family for 9 years and her furbrother was refusing to eat since her disappearance. This could have ended VERY badly. Hayley says she doesn't hold any grudge against the shelter. After all, they didn't murder her dog and they did find her a new home quickly. Hayley would also like to thank all of those who worked so hard last night in thinking of ways to get Magic back. All I could think of when I read this story was "Hayley's birthday is the 14th and she's going to be miserable without her dog." Happy birthday Hayley! We've also learned how fast networking can work. There's a commercial in the U.S. of a little girl losing her dog. It promotes cell phone surfing but the idea is brilliant. A man sees the "lost" poster and takes a photo with his cell phone. He forwards it to all of his friends and the dog is found within minutes. The commercial ends with the little girl being reunited with her dog. Not always the ending we get, but it's the one we hope for. Always have a current photo of your pet along with a plan on what to do if your pet is lost. Don't wait until the unthinkable happens. Write it down. You'll be too upset if the time ever comes and you have to use it. One thing I'd like to add in closing is it's a felony in the U.S. to steal an animal and not give it back to its rightful owner. A fine and jail time may be given for this offense. Perhaps shelters worldwide need to fall under the same rules as private citizens. Please check out this site as your "homework." There's a lot of good advice on this webpage. I hope I've provided a bit of education. I think we all tend to forget the "collar and I.D. tag" since the micro-chipping technology is considered the best form of identification. Apparently we need both. And we need to be very proactive when a pet goes missing. Time literally does run out for a lot of pets who are simply lost and want to go home. Thanks, Elisa, for another brilliant article! I was disturbed, however, at that horrendous 'alleged' shelter that euthanized that poor cat even though it was chipped. I agree with a previous poster who said, with their track record, they should shut their doors permanently. Our local shelter chips every animal that comes through the door, including bunnies and guinea pigs. We don't normally take in birds, so I'm not sure how that is handled on the odd occasion we get one. Birds we get are immediately transferred to another no-kill facility that specializes in aviary. Microchipping also settles domestic disputes. We had a case of revenge when a dog was turned in, unbeknownst to the female caretaker. The ex hated the dog and apparently told her it ran away. The shelter found the chip and contacted the owner who filed a police complaint about the ex. The shelter kept the dog during the proceedings and when it was settled, she got her dog back. A happy ending for what could have been tragic. Thanks Elisa - useful stuff. As per your instructions I changed Magic back to a girl! When doing Cats Protection lost and found we were able to match up some cats to their 'owners' thanks to them being microchipped. CP branches here have a scanner which is great as it saves a trip to the vets. Collars can be treacherous to cats, even the supposedly safe release ones. A neighbours cat was recently found helpless hobbled by her collar, somehow it had got down her body trapping her front legs.She now has a microchip and no collar.Thankfully if a cat doesn't clock in regularly in our neighbourhood we all go on the alert until they are found so she was lucky. A cat we took in last year and no one claimed her, had her front leg through her collar and was helpless.No address on the collar or phone number so no point in putting it on. And don't get me started on flea collars, those lethal things should be banned. Our own cats are microchipped with the chips that also show their temperature when scanned.Far more dignified for them than having a thermometer up their bot ! Elisa thanks so much the reminder is invaluble. Every time I go to the vets now I'm going to ask them to check my cats chips. She went to lovely people and I sent off the paperwork to have her details changed for her chip. When her new owners took her for her first check up at her new vets no chip could be found; they had to have it re-done so what you say is perfectly true. Its scarey; why does no one tell you this? Vets should check the chip on each visit. As for that animal shelter they ought to be closed down after this latest episode. They are taking peoples money on false pretences. Poor O'Malley and his poor family I feel deeply for them. Thing is how many others are they destroying? How can this hapen? I associate shelters with caring people there to do the best for the cats but it seems that animal cruelty lurks in every corner. Close them down and send the cats to caring shelters. The county I live in has an enormous population of stray cats & dogs - and an extremely limited budget for Animal Control. As a result, they've passed quite a few laws regarding pet ownership, with microchipping being the latest. Overall, I think it's a good idea, although there really is no substitute for a pet owner's vigilance. In my case, I paid a handyman a few hundred dollars to screen in my tiny porch, and I'm careful to close one door before opening another. Has it kept my cat in 100% of the time? Of course not! So having him 'chipped' is useful as a back-up. Thanks for the reminders in this article that once a pet is microchipped, maintenance is still required! Keeping the info up to date, having the vet check to make sure it's still working, etc. - those are the responsibility of the pet owner and so important. Great article!!! Good writing! these stories need to be told! Good good good good Great! Good to have these stories told! I listed Magic as a boy at one point. Sorry Magic. You're a beautiful girl.